You cannot assume your players know even the most basic rules. Take what happened at Fenway Park on May 1, 2018, when the Red Sox hosted the Royals. In the top of the 10th inning with the score tied 3-3, the Royals had runners on first and second and two outs when Sox catcher Christian Vazquez scooped up a Carson Smith pitch with his mask, a violation of rule 5.06 (E). With Lucas Duda at bat and a 1-2 count, Smith fired a pitch that bounced out of Vazquez’s mitt. The ball then rolled behind the shinguard on his right leg where he casually picked the ball up with his mask. When plate ump Chris Conroy called “Time,” apparently seeing no further action, he awarded both runners one base, putting runners on second and third. The runners were stranded but it could have been damaging to the Sox who lost the game in 13 innings, 7-6.
or go to MLB.com, May 1, 2018 KC@BOS: “Vazquez uses face mask, ruled as balk. Players must realize that improper use of detached equipment is against the rules. The catcher’s mask was designed for protection, not to field a ball. The fielder’s glove was made to catch a batted or thrown ball, not to be tossed at a thrown or batted ball. When the catcher uses detached equipment to field a pitched ball, the award is one base from the position of the runner/s at the moment the ball was touched. At the time Vazquez fielded the ball with his mask, the Royals had runners on first and second, so they would each advance to second and third respectively. The ball remains in play until there is no further action. Let’s say the runner on second base attempted a steal on the pitch. If he had reached third before Vazquez handled the ball with his mask, he would be allowed to score while the runner on first would be sent to second base. In the video provided by MLB.com (see above), notice the title, “Vazquez uses face mask, ruled a balk.” The violation was not a balk. The Red Sox TV broadcasters also incorrectly referred to the play as a “catcher’s balk.” There is no such language as a catcher’s balk in the Official Baseball Rules. Before the automatic base-on-balls was instituted in 2017, the pitcher had to throw four wide ones. If the catcher stepped out of the “imaginary” catcher’s box early, and the pitcher delivered the pitch, a balk was supposed to be charged to the pitcher because of the actions of the catcher. However, the rule (6.02 (a) (12) was seldom enforced. Although this was commonly referred to as a catcher’s balk, there was and is no such language in the rule book. One caption identified the Vazquez play as catcher’s interference. 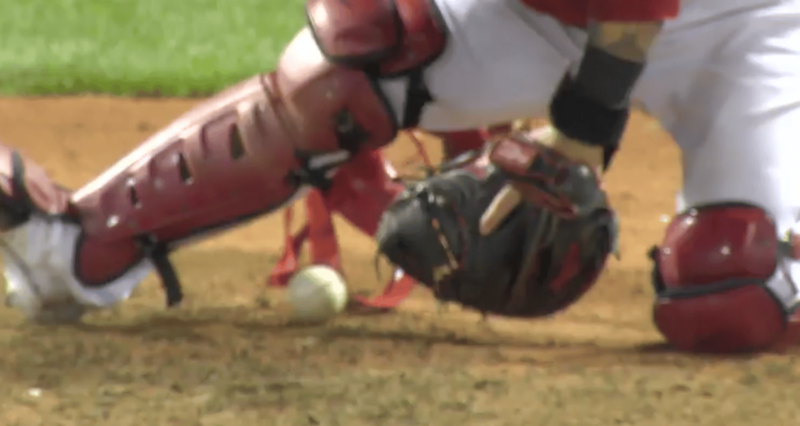 This is not considered catcher’s interference. It is a violation of detached equipment. When a fielder throws his glove and makes contact with a thrown ball, the award is two bases from where the runners are at the point the fielder’s glove touches the ball. See rule 5.06 (4) (D). The ball is not dead unless it lands in dead ball territory. If any runner attempts to advance beyond his awarded base, he does so at his own risk. If no contact is made with the ball, there is no violation. The Red Sox and Reds played at Great America Park on Sept. 24, 2017. In the bottom of the fifth inning the Reds had Adam Duvall on first base with two outs when Jackson Stephens singled on a flare to center. Red Sox center fielder Jackie Bradley Jr. fielded the ball and air mailed it into the Reds’ third base dugout. The umpires allowed Duvall to score because he had second base made the moment JBJ released the ball. Stephens was sent to second base because he had not yet made first base at the time the ball was released by the Red Sox center fielder. Sox third baseman Rafael Devers tossed his glove at the ball but because there was no contact, there was no violation. If Devers made contact with the ball, the Reds’ runners would each be awarded two bases from their position on the bases at the time Devers’ glove touched the ball. or go to Mlb.com, Sept. 24, BOS@CIN, “Stephens singles, Duvall scores on an error. When a fielder throws his glove and makes contact with a fair batted ball, or a ball that has a chance to be a fair ball, the award is three bases from where the runners are at the point the fielder’s glove touches the ball. The ball is not dead and the runner can attempt to advance beyond his awarded base at his own risk. See rule 5.06 (4) (B). On May 28, 2005, the Diamondbacks hosted the Dodgers. In the bottom of the seventh inning, Arizona was trailing 4-2 when Luis Terrero hit a soft pop-up over the head of Dodgers’ pitcher Duaner Sanchez. In an attempt to stop the ball, Sanchez threw his glove in the air and made contact with the ball which landed a few feet from the pitcher’s mound. Terrero was awarded third base on the play. The D’backs rallied and won the game, 5-4. You can view this play by going back to cover note on this email. The Los Angeles Dodgers beat the Colorado Rockies 8-0 on July 2, 2013, in Colorado. In the bottom of the sixth the Rockies had D.J. LeMahieu on first and no outs when Josh Rutledge laid down a bunt that rolled between the pitcher’s mound and the first base line. Dodgers’ pitcher Clayton Kershaw, in an attempt to stop the ball, threw his glove at it. Fortunately for the Dodgers, the glove did not make contact with the ball. If it did, Rutledge would have been awarded third base and LeMahieu would have scored from first. BTW-the base awards for the above detached equipment rule violations is more clearly explained in the MLB Umpire Manual. It states the base award occurs “from the time the ball was touched.” The language in the Official Baseball Rules just gives a general base award like “two bases” or “three bases.” Omitting the words “from the time the ball was touched” can be confusing and problematic. In all of the above situations, the ball remains in play. If the runner attempts to advance beyond his awarded base, he does so at his own risk. The base on balls and detached equipment rules are the only awards where the award itself does not cause the ball to become dead. Remember, NEVER ASSUME your players know even the most basic rules.